In addition to being a mother and a blogger, I also work full time outside the home as a 9-1-1 Dispatcher. I am woman - hear me roar! With being so busy, I need office and organizational products to help keep my life in order. See Jane Work is a company that embodies women to become more organized while maintaining style and expressing their individuality. 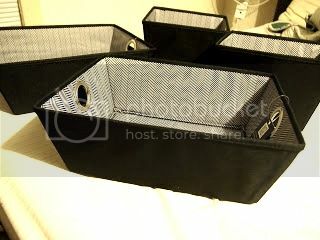 I received four decorative storage fabric bins from See Jane Work in two different sizes. The outside of the bins are plain black and the inside have black herringbone designs. Each bin has silver grommets on each side. The hard bottoms are sturdy. There are several ways that the fabric bins can be used. For instance, I've used one of my bins to place photos in that I plan to scrapbook with in the near future. Another I've used to place blog paperwork in. The third I've used to place books in that I'm currently reading and reviewing on my blog. A friend recently had a birthday party and rather than use a paper bag I used one of the bins to place her gifts in and presented it to her. There's a variety of ways to use the fabric bins and they are classically designed to match most any decor. Two people will each win one small and one medium decorative storage fabric bin in black herringbone design. I like the Paperboard Letter Sorter, Lace. I like the Hippo Memo holder - so cute! I'm in love with everything from their vintage style line, especially the Vintage Basket-High! I like the Basic Letter Boxes. I like the Chevron Canvas Bins. Love the Semikolon CD Photo Box and Card Box. I like the Leather Passport Covers. I really like the Lilly Pulitzer Desk Caddy! The See Jane Work basic letter trays are useful and very attractive! The See Jane Work basic letter trays look so sharp and would be useful to me! I'd love to have the Quack Tape Dispenser. What a great giveaway! I am all about organization. I also like their Canvas Tall Bin-Skull. I would like the bungaloo junque trunk in pink wave pattern. the desk caddy would be nice for work! I like the Jane Marvel Nylon Metro Tote. I also like the Semikolon Desktop Notes. ~ Angie B.
I love the Bungalow Rump Roost Medium-Pink Ikat. OHHH cool I Love to do gifts in fabric bins! I would love to have the Jonathan Adler iPad Case Stand. I like the bamboo dry erase board. I love, love, love the pocket strip wall organizer! I would love to have the See Jane Work collection. I need to get organized. Thanks! The Elephant Pencil Cup holder is too cute! Love the Bamboo Desktop Dry-Erase Board! Thanks! i would love the goldfish pencil sharpener, so cute! I like the Flower Cork Board. I love the Lilly Pulitzer Desk Caddy, thanks! I like the Vinea Wall File! I could really use a few of the basic letter boxes! I'd like the Baggu Canvas Duck Bag - Sailor Stripe. I also like their Studded Leather Pencil cup, so chic!